The Death Throes of the High Street - looking back to the future. Where do you find your “White Space” to think about your business? I have never been inclined to be the harbinger of doom, but from where I’m standing, the facts, and what they might mean for the future of ‘High Street’ shopping seem irrefutable. 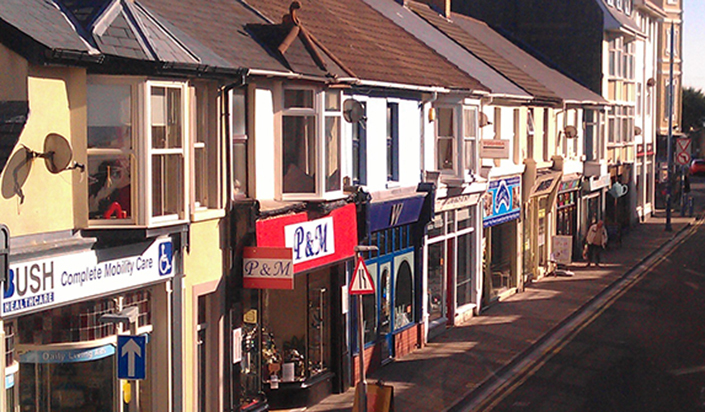 We are already seeing businesses in High Streets up and down the country suffer. More and more are closing: this might partly be attributed to the recession; there has been a decline over a number of years that could be due to the increase in out of town shopping centres, the retail giants thrown together with massive car parks, cinemas, fast food outlets and more. But now a new threat has emerged, much larger and more virulent than ever before. The traditional customers are now staying at home and doing their shopping on the internet. Month by month we see a continued increase in the number of people buying online. These people used to shop in the ‘High Street’ of the villages, towns and cities all over the UK. If you’ve seen the news at all over the last few months, you’ll be aware of the problems retail traders are experiencing. In June 2010, weekly online retail sales in the UK reached £1.15 billion. This represents nearly 20% of UK retail sales, increasing year on year at an exponential rate from just £1.8 billion in the whole of 2001 and there are no signs of this growth rate slowing. To put that into perspective the three top shopping streets in the UK: London’s Bond Street, Oxford Street and Regent Street, during 2009 took £5.2 billion in sales. A creditable sum, but less than 5 weeks’ turnover for the shops along the ‘online high street’! What’s more, these online shops are open 24/7 and accessible from every home, office or even café that has an internet connection, moreso, wifi hotspots have sprung up everywhere and its even now possible to shop on a mobile phone. A series of reports from research company IMRG/CapGemini add further weight to this. IMRG/CapGemini predicts that if current trends continue, within 10 years 50% of the UK’s retail sales will be done on the internet. Of course, a prediction is only that, a prediction, but even the most sceptical can not ignore the enormous increase in online sales. While this is likely to have a devastating affect on those who have their livelihoods in the high street, the broader impact is potentially far bigger. Councils – not known for being fast moving when it comes to policy – may need to rethink their development strategies and seek innovative ways of attracting people to town and city centres. Governments might also have to look at potential falling tax revenues due to companies that are set up to trade and sell online only, who can base their headquarters in offshore locations more easily that traditional ‘bricks and mortar’ companies thus benefiting from lower taxes as well as labour costs. Speaking of Governments, all major countries are pushing for the roll out of faster broadband and service providers are also developing faster and better ways of providing internet access. In South Korea and Latvia broadband download speeds are in excess of 20Mbps, 10Mbps broadband is considered slow, yet in the UK we can’t even get it together for 50% to have 2Mbps with many in rural UK confined to no-go zones or not-spots. Finland has declared broadband to be a basic human right! So when will the UK catch up with this, if we are to compete in a global marketplace, we at least need to be competing on a level playing field. This is even more important post-recession. The larger national chains are already preparing for this movement of customers with Tesco being current leaders in the race to gain market share with online grocery, home products and everything else they can manage to sell while providing home delivery for the weekly shop. Young, fast-moving and well-funded start up businesses are looking at the marketplace and seeing that there is a raft of opportunities to be had online as internet usage becomes mainstream – not just for the geeks or the young – and continues to permeate the population. The future is exciting for those who are determined to take part, be engaged and make the investment. However, those who are determined to stick their heads in the sand, or make smug remarks about not really being ‘into’ technology, or even worse all those people out there who say “Oh yes our website is under construction/redevelopment’ as if we can’t see that (being as it is online, in the public domain). I can only assume they are hoping ‘it’ (the internet) will stop soon. What are they waiting for and what are they going to do when they can no longer rely on the dwindling numbers who take the journey through a high street that has only a few shops in it? The reality is, in just over 15 years, the internet has become the most dominant feature of daily life, creating opportunity for many and changing the very fabric of our society. We have no way of really telling what effect it will have in the next 5 or 15 years, or who it will affect. Since the 1980’s local councils and planning departments have been working to ‘improve shopper’s experiences in the centres of their towns and cities. To this end they have virtually banned the car from the high Street by pedestrianising the high street and setting up ‘park and ride’ services. The national chains reacted by moving their stores to out of town shopping centres and abandoning the town and city centres that had been the trading centres of these locations for a hundred years. The new out of town centres were a success from the start each one growing and drawing more and more shoppers to the point they became congested through their own success. Today the advent of the speed camera and other traffic reducing programmes city and town centres have become the domain of café and nightclub with only a few of the larger chains remaining. The congestion in the large out of town centres has become a delay for most shoppers and they have discovered the advantages of the internet. No travelling, no speed cameras, no parking problems, no congestion, no cues at the checkout and no waiting in traffic to get home. Take the example of the stress of young mother with two small children who has to get to the shops to buy their weekly groceries. She has a small child of 4 and a baby of 9 months. They live in a quiet area and the car is parked on the street. To go to the supermarket in the out of town shopping centre she has to get the two children ready load the car and set off to the supermarket. Does she put the children into the car first and then go back to the house and get all the bags and other necessities for any trip with small children? She set off in the car after resolving this problem and heads to the supermarket. When she gets there the car park is half full but she manages to find a mother and toddlers car parking place. She now has to get herself and the children into a trolley and into the shop. Does she lock the children into the car whilst she looks for a trolley – she cannot carry both children and the bags? This problem overcome she gets into the shop and then has to shop and keep an eye on the 4 year old making sure he does not run off disappear or get kidnapped! (Stress can do this). After negotiating the isles and finally getting to the check out she has to queue to pay for her purchases – we have all seen the chaos at the checkout at busy times. Goods paid for the young woman has to head for the car with here purchase. Again there is the dilemma of getting the kids into the car and then her purchases. If it starts to rain then it all adds to the stress and problem. Now in the car she is heading home thinking about how she is to get the children into the house and her groceries. At some point she is going to have to leave the children alone whilst she gets the food from the car. The whole experience is time consuming and stressful about 4 hours end to end. What is the alternative? Have 4 hours quality time with the children and after they have been put to bed at night get a glass of wine and go online. Her groceries can be ordered and paid for on one of the many supermarket websites and a few days later a nice person from the supermarket comes along and puts her groceries inside her front door. All she has to do is put them into the cupboards. This is only one scenario as described by a number of young mothers that I have spoken with. They still use the supermarkets but do much of their main shopping online freeing up their time with their children. One other point here is the environmental impact. Instead of 15 people driving to the supermarket in their cars only one vehicle drives and delivers to 15 houses. This is a reduction of carbon emissions helping the environment. This is all well and good for the big companies but what about your business where your budget is in the thousands not multi millions? How can you move your business online and reach your customers? As a high Street vendor in your town, you have to deal with competition from those who are also in the same area. You differentiate your offering with special offers, better customer service and after sales service that whilst you may be more expensive your overall offering is perceived as better for your customers. You may also have only one or two competitors in your town. On the internet you are likely to have hundreds of competitors each one vying for the top listing in the search engines and each one trying different ways of getting to the customer. You all purport to offer the best customer service but online customer service starts long before the customer reaches your website. The way of dealing with the online customer is vastly different from the high street and this is where so many websites fail to connect with the Digital way of thinking. A website is not like a store it is a system. I was in the new John Lewis Flagship store in Cardiff the other day standing at the top of one of the escalators studying the layout of the store for each floor. My wife asked me why I kept jabbing at the sign and I explained that I wanted to go to the men’s clothing department. Why were you jabbing at the sign she asked again? I explained that it was two floors down and if I was on their website I could get there just by clicking on the link. Instead I would have to take two escalators down and then walk across the floor to reach the department I wanted. It is the realisation that a website is a system just like the internet itself that helps business owners get to grips with the concept that things have to be done differently online. The physical world has restrictions whilst online there are none. If you present any barriers within your website, then the user or Customer will leave. Some of the best know brand names have still not understood this concept and whilst offline they have an impeccable customer service reputation – online they are damaging their brand identity on a daily basis – 24 hours a day. By placing barriers and small obstacles in front of the users need to get the task completed they are unwittingly building to the frustration threshold that the user will not cross. Rather hitting the back button and invest their valuable time on a competitor’s website where there are fewer barriers. The process of getting the right layout for your clients and users is iterative and is ongoing. The first step should be to get a User Experience expert to review your website. This is not a web designer who is trying to sell you a new website, but an independent UX expert who can give you the facts as relating to criteria and conventions that have been determined by research and years of experience. Summing up if you do not engage with your customers online then the chances of your survival will diminish and your business will be consigned to the history books of retail.